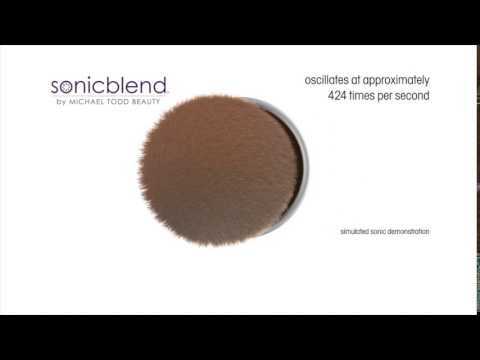 Fall in love with your polished, airbrushed-like, flawlessly-finished complexion that only Sonicblend can give you. Sonicblend is an award winning and patent-based sonic makeup brush that has changed the way we apply our liquid, cream, powder and mineral makeup for a completely elevated final look. You will love how Sonicblend quickly and easily applies your favorite makeup for a perfectly even, blended and seamless finish. It even improves the look of fine lines and enlarged pores all in one simple step. Revolutionary sonic technology with movements at approximately 24,000 time per minute expertly disperse makeup in very fine particles instead of larger granules for a polished-looking finish that lasts all day. Sonicblend comes equipped with a super lush brush head with a patented antimicrobial protection that guards the brush head from 99%+ of the bacteria that can grow on unprotected surfaces. Apply makeup with the confidence of knowing that you are using a fresh and clean protected brush head every time. Sonic technology paired with super lush brush bristles work together to apply your favorite makeup in very fine granules that form an interlocking pattern. This interlocking pattern fills wrinkles and pores from the bottom up to create a perfect flawless finish. Sonicblend comes with a 1 Year Limited Warranty so that you can apply your makeup with confidence. You will love USB rechargeable battery that runs continuously for up to 60 minutes. Get many uses out of your Sonicblend before needing to recharge. Liquid and Cream Makeup: Apply a small amount to the brush head or dot onto skin. Power on the brush and glide the Sonicblend around the face allowing it to apply your makeup flawlessly. Mineral or Powder Makeup: Swirl the brush head into a compact or lid with loose powder. Tap off excess makeup, then power on your Sonicblend. Glide Sonicblend around the face allowing it to disperse the perfect amount of makeup for a polished finish. Please note recommended for use only with 5V 1A wall charger or via USB slot on your personal computer. Any wall charger with different specs can cause the unit to overheat. Please note the first few times of use you may experience a few hairs shedding with the Sonicblend brush head. The brush head can be washed with shampoo to rid the initial shedding. Please refer to your Operating Manual for proper charging and care instructions before your first use.